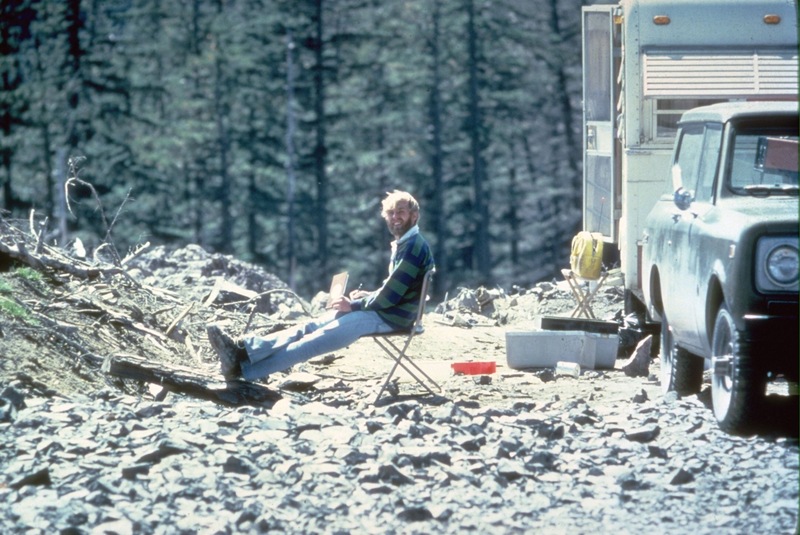 Those were USGS volcanologist David Johnston’s last words from a ridge overlooking Mount St. Helens when it erupted on May 18, 1980. He was a mere 6 miles from the crater. The pyroclastic flow….hot gases and rock…took less than a minute to overtake his position and sweep him away. He was never found, although pieces of his trailer and backpack were. Besides him, 56 other people died…but thousands others were saved by Johnston’s warnings of an impending eruption. Harry R. Truman was another of the volcanos’ victims. 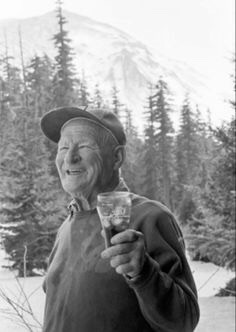 He had owned the Spirit Lake Lodge since 1928, which was located just 1 mile from the base of the mountain. He refused to heed the evacuation warnings, choosing to believe that the increasing earthquakes would settle down. The building, lake and him are buried beneath 150 feet of rock from the blast, and a new Spirit Lake formed at a higher elevation above the location. Diana and I had visited Mount St. Helens back in 1996, just 16 years after the 1980 eruption. At that time, thousands of acres of surrounding landscape laid barren. The closest approach we could make by road was the Coldwater Ridge Visitor Center, a good two miles back from Johnston’s campsite. 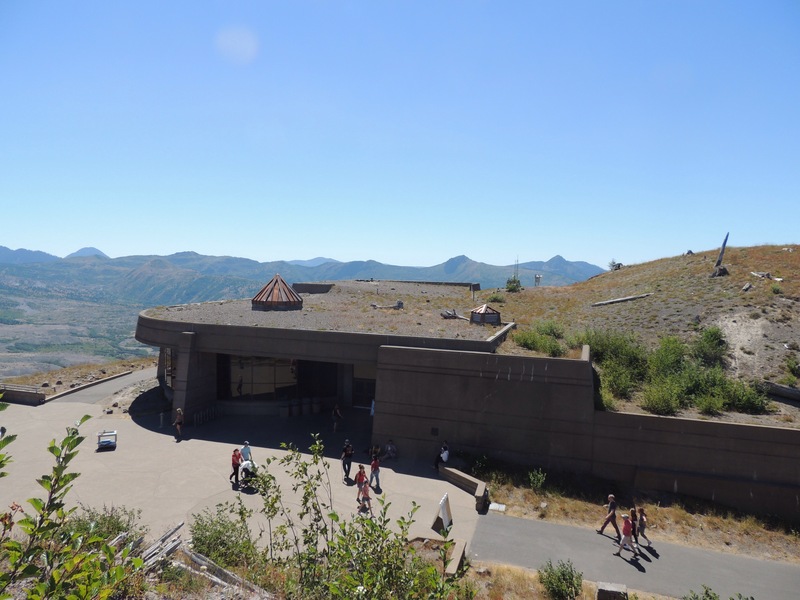 We had heard that they had built a new visitor center since then, so we definitely wanted to get back and see it while we were here in Oregon. We also wanted to see our friends Lee and Tracy, who are work camping a few hours away from there. 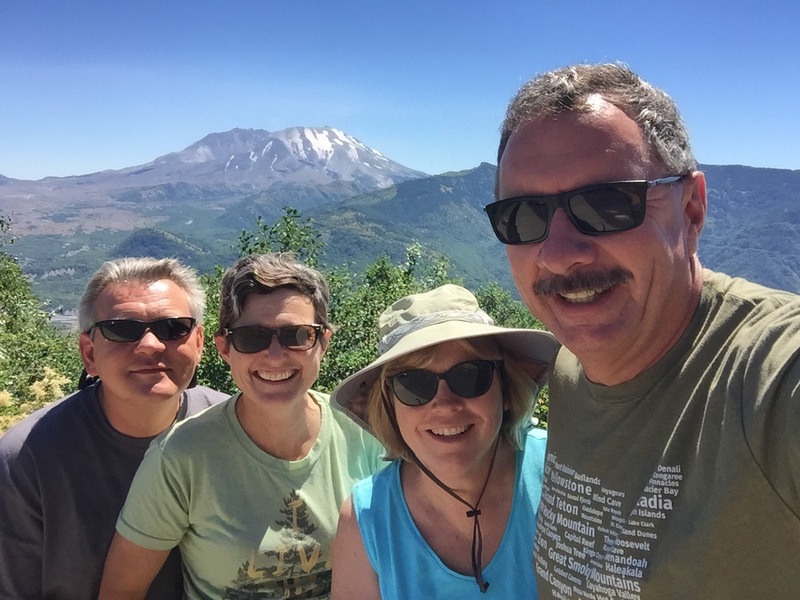 The four of us made plans to head to Mount St. Helens on Tuesday, August 2nd. Coming in from the west, there are several viewpoints along the way. 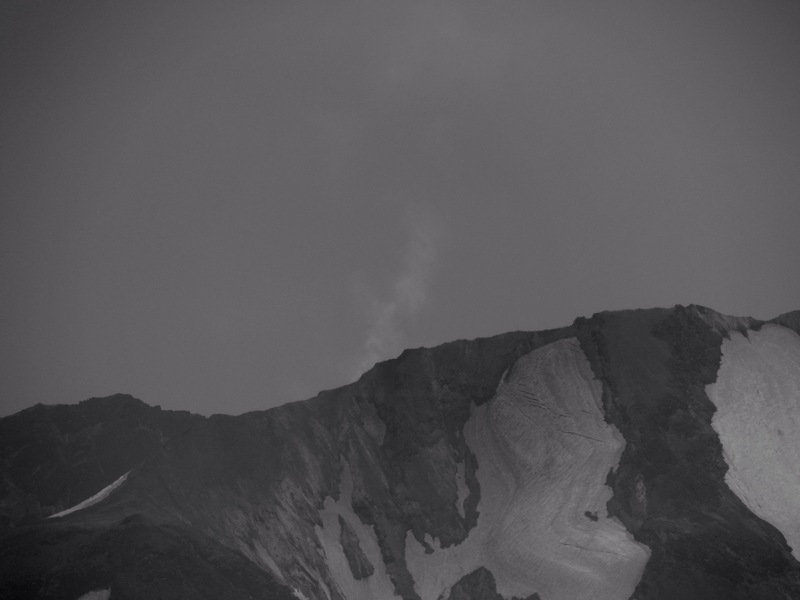 With the top 2000 feet of the mountain removed by the eruption, it looks less than spectacular from this angle. The land outside the park boundaries is owned by Weyerhaeuser Corporation, and was replanted three years before we were last here. Those trees have grown a lot in the time since. Upon arriving at the new visitor center, the view of the crater and the surrounding landscape opens up dramatically. At this point, we are a full mile closer to the mountain than David Johnston was when it erupted. The lava dome in the crater has grown dramatically since we visited in 1996. It won’t be too many more years before it is higher than the edge of the crater rim. Mount St. Helens has a major eruption every 125 years, so we were in the presence of a very active volcano. While the steam rising out of the mountain was slightly unnerving, it also made being there very exciting! Here is Tracy taking in the view. Her standing there really puts it into perspective how close we were to the crater. 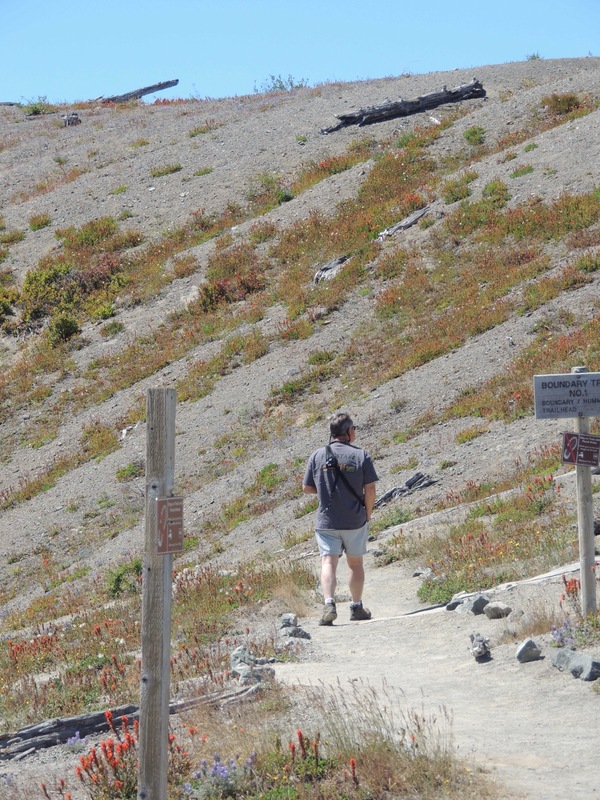 We took a trail that heads out above the Johnston Visitor Center and towards a straight-on view of the volcano. Looking back down, you can see how the building is built into the hillside. And off to the north…the direction the mountain blew…an entire forest of trees still lays over from 37 years ago. This area within the boundaries of the national monument is being allowed to regrow naturally, and it is amazing thing to see how quickly that is taking place. 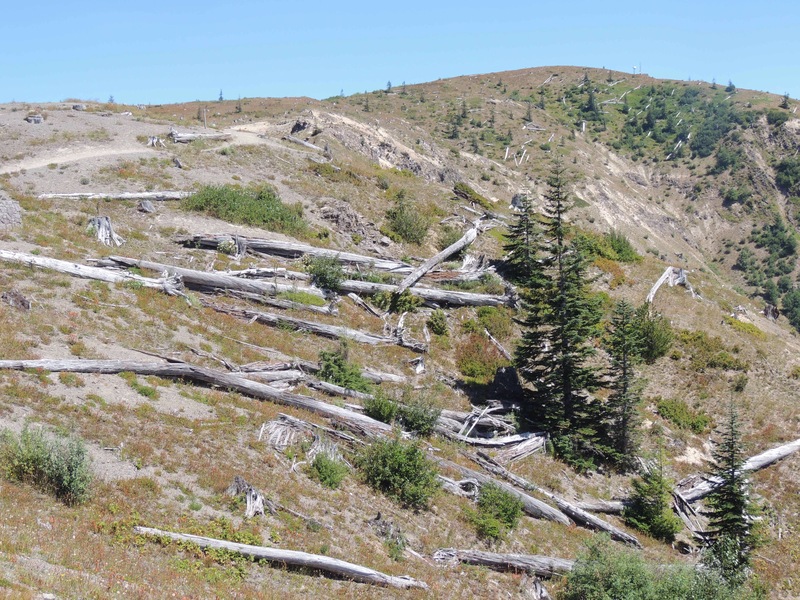 Still, it’s going to take a long time for a complete forest to return, only to possibly be blown over again by future volcanic activity. Diana and I remember the vivid red sunsets in Michigan during the summer of 1980 that were caused by the volcanic particles in the air. That doesn’t seem like it was all that long ago. Heck, had David Johnston survived, he’d only be 67 years old today. 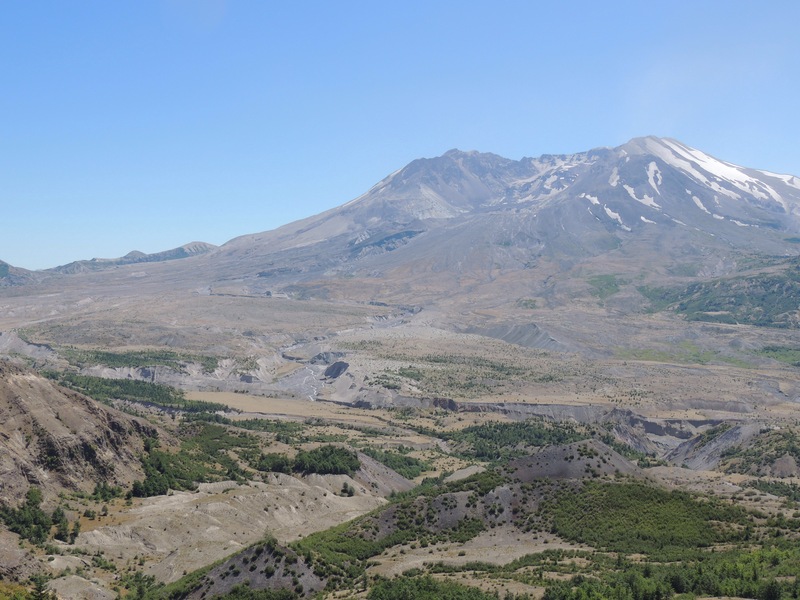 To see how much things have changed in such a short period of time definitely make Mount St. Helens a place we want to come back to in the future! Be sure to CLICK HERE to see Tracy and Lee’s excellent post about our trip! 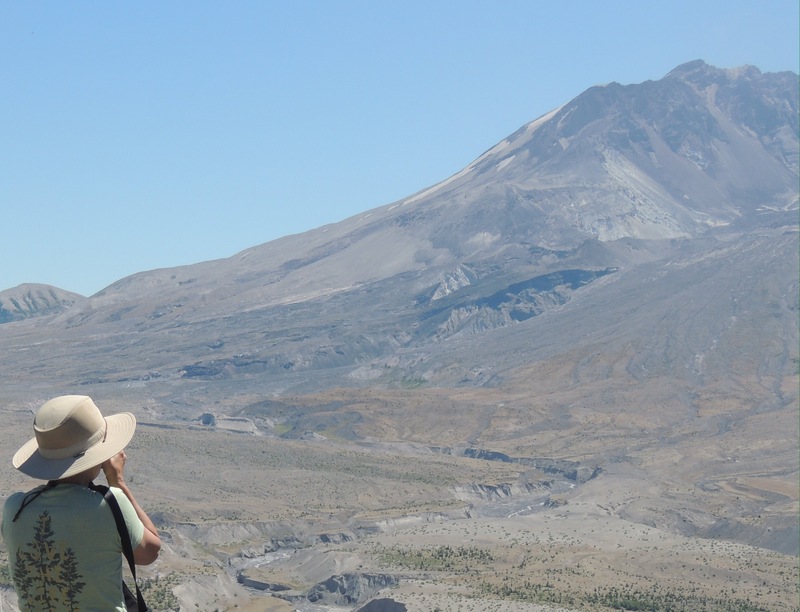 A Mount St. Helens day hiking guide, plus anything else imaginable by searching our exploRVistas Amazon link by clicking HERE. What a great experience to be in the presence of such a powerful mountain. It really was amazing, Bonnie! Hope you and Fred get to see it when you are out this way. My first trip to Mount St. Helens was the summer of 1981. We could only go so far before we hit the red zones. I have a photo of of the mudflow line in the trees about 20 feet above my head. The last time I was there was in 2014. What a difference! Great blog, Jim! Thanks, Linda! That must have been something to have been there the year after it blew! That’s such an amazing place! It was a big deal to us in Northern CA when it happened. It’s been years since we were there last and we look forward to seeing it again next year. We were amazed how much it changed, Debbie! I was making plans to move to Missoula at the time the mountain blew – glad I wasn’t there yet! Thanks for including the info on David and Harry, it makes all the information so much more personal 🙂 Wonderful that a new lake formed on top of the old one – nature is amazing. I had no idea it was still steaming. I imagine Missoula got a lot of ash, Jodee! I remember David and Harry’s stories so well from back then. Great post! Bill and I will have to go back as a lot wasn’t open when we were there (too early in the season). One of the cool things to me was that I remember when it happened – esp because my Dad was working in Northern CA at the time! Everyone was nervous because we didn’t know how far it would go! So glad you got to spend time with Tracy & Lee! We might go back someday and kayak Coldwater Lake (see Tracy’s post), as it looked interesting to us. I think we need to camp near there to do that though, as it gets too hot in the afternoon. I watched it blow from the balcony of my apartment outside of Beaverton. I was working in Portland at the time, and the ash piles on streets and in parking lots were huge. We’ll be there to check it out next week. Wow…that must have been amazing to watch, Mariel! Indeed. Also had a friend at work whose brother was a private pilot and he flew me and my parents around the site as soon as the air space was open. Really great to see how it’s coming back. Seems like one of those iconic moments in history. . .where were you when. . .
We were camping in the wilderness on Vancouver Island and heard the eruption but had no idea that’s what it was until we reached civilization. When we got home there was ash everywhere. We tried to visit the area in the 80’s but it was foggy and rainy so never saw it. Thanks for the tour! Wow…that must have been something to actually hear it and not know what it was! I never could bring myself to visit Johnston’s Ridge Observatory. It will surely be blown away in a future eruption. Yet I loved working on the remote south and east side of Loowit, watching life return on a daily basis. Glad you got to revisit. I wasn’t overly impressed with the visitor center itself, but the location was prime. Still, you are totally correct that it won’t last one minute in an eruption of the magnitude of 1980, Gaelyn. Great place! It is a little intimidating standing so close while it puffs and makes silesas you mentioned! Loved being here with you guys and great job sharing the stories of the people who died! That was an important thing for people to know. Thanks, Tracy! We loved the way you illustrated the rebirth of the area! We really had a great time with you guys! What a fascinating post! I was in nursing school at the time of the eruption. it seems almost surreal now. Including the stories of those lost their lives makes it all the more real. Such powerful forces beneath the surface of this earth. Just saw this comment, Sue…it was in my spam folder! If you get a chance to visit, be sure to check it out! No doubt on that, Sue! We will keep the life ring at the ready!